Regardless of the reason for your unfiled taxes, you need to take this problem very seriously. The IRS is becoming quite skilled at finding non-filers. Even if they have not found you yet, they will, and you may face very serious consequences if you continue to ignore the situation. The failure to file a tax return is a misdemeanor punishable up to one year in jail as well as a fine of not more than $25,000 ($100,000 in the case of a corporation). Even worse, a taxpayer who fails to file returns for multiple years commits a separate misdemeanor offense for each year. Therefore, it is necessary to get unfiled tax returns help and take action now. To avoid the aforementioned consequences, it is important that you address the situation immediately. The good news if you are facing unfiled tax returns is that the IRS is typically lenient with those who are proactive in trying to remedy the situation. Individual tax filers and businesses that have delinquent tax returns can enter the IRS Voluntary Disclosure Filing Program. This allows non-filers to re-enter the tax system without the threat of a criminal investigation. In addition, you may find that your unfiled tax return leads to a tax refund once you file. By waiting and ignoring the problem, you could be preventing yourself from collecting money that is owed to you. Perhaps you are avoiding your unfiled returns because you fear you will owe a substantial amount of money. If you do owe money, the IRS may allow you to enter into an installment plan to make payments against your back taxes. With unfiled tax returns help from a tax lawyer, you can negotiate a workable payment plan on which you can live without a significant change to your lifestyle. Also, a tax attorney can analyze if you qualify for an offer in compromise or other tax liability solution. 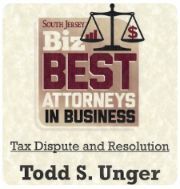 New Jersey tax lawyer Todd S. Unger has handled tax controversy cases just like yours for people and businesses all over the state. He will help you gather the necessary financial information, complete the IRS documentation, and negotiate a resolution that works for you or your business. Contact Todd Unger today at (877) 544-4743 for a confidential consultation to discuss your back taxes and potential solutions.